Flying saucer spotted over Mars ... and it's ours! This color full-resolution image showing the heat shield of NASA's Curiosity rover was obtained during descent to the surface of Mars on Aug. 5 PT (Aug. 6 ET). The image was obtained by the Mars Descent Imager, known as MARDI, and shows the 15-foot (4.5-meter) diameter heat shield when it was about 50 feet (16 meters) from the spacecraft. This image shows the inside surface of the heat shield, with its protective insulation. The bright patches are calibration targets for MARDI. Also seen in this image is the MEDLI hardware attached to the inside surface. At this range, the image has a spatial scale of 0.4 inches (1 centimeter) per pixel. This is no science-fiction movie or UFO hoax: It's a real picture of the heat shield falling away from NASA's Mars Curiosity rover, snapped by a camera on the rover's underside just a couple of minutes before Sunday night's landing. 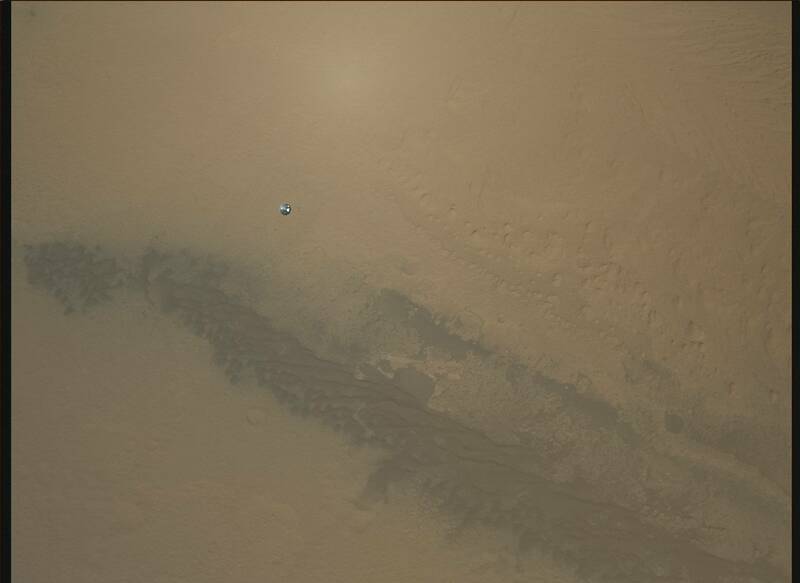 We've already seen a low-resolution movie clip of Curiosity's descent, as recorded by the Mars Descent Imager (a.k.a. MARDI). This is the first high-resolution MARDI imagery to be sent down. Eventually, hundreds of frames will be transmitted to Earth and combined to create a high-res movie showing the rover's-eye view of Curiosity's touchdown on the Red Planet. "This is the good stuff," said Mike Malin, who heads up the MARDI team. The imagery has already been compared with pictures taken by satellites orbiting Mars to figure out exactly where Curiosity ended up. Still more of Curiosity's high-resolution cameras are due to get up and running in the days ahead. This picture, showing a field of dark dunes running across the red Martian soil inside Gale Crater, is just part of one full-resolution frame: For another version of the wide-angle view, sweetened with a little extra image processing, check out Emily Lakdawalla's post on the Planetary Society blog. Stay tuned for the rest of the movie from Mars. I have a feeling it'll have a happy ending. 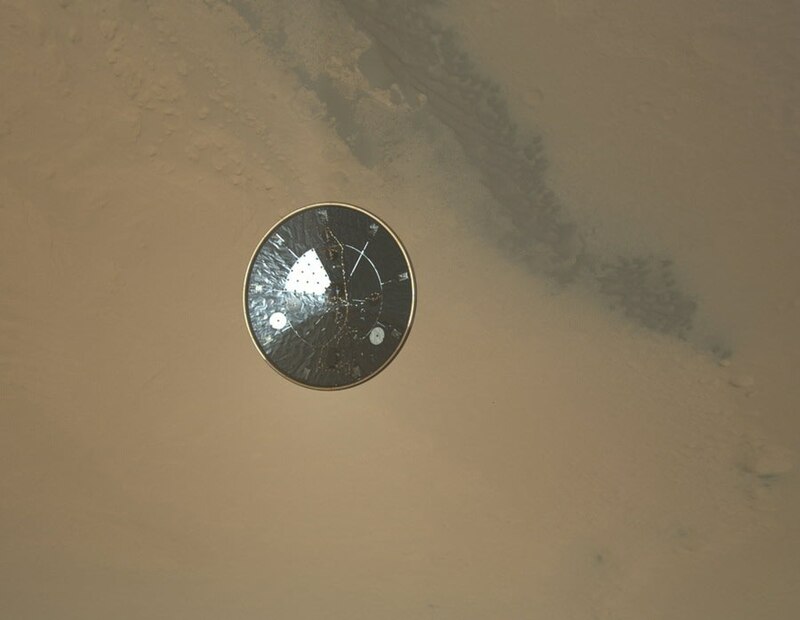 In this wide-angle view, the disk-shaped heat shield from the Mars Science Laboratory spacecraft can be seen falling away against the backdrop of the Red Planet's Gale Crater, less than two and a half minutes before the Mars Curiosity rover's landing on Sunday night. This image is part of a full-resolution view provided by the Mars Descent Imager, a camera mounted on the bottom of the rover. Mike Malin, a member of the Mars Curiosity rover science team, unveils imagery showing where the rover's ballasts hit the surface — as well as a high-resolution view of the rover's heat shield flying away during descent. Update for 2:30 p.m. ET Aug. 8: I've added the super-amazing flying-saucer close-up at the top of this item, as well as a video featuring Mike Malin of Malin Space Science Systems, explaining the MARDI image as well as some of the attractions seen from orbit. Hat tip to Doug Ellison at UnmannedSpaceFlight.com and NASA's Jet Propulsion Laboratory.